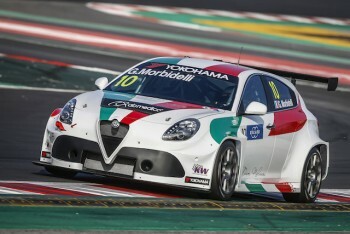 Volgend weekend rijdt de TCR Middle East in Abu Dhabi. Voor Mulsanne racing / Giulietta team komt de Georgier Davit Kajaia aan de start. Hij reed vorig seizoen voor Engstler in een VW Golf GTI . 10e algemeen in de kampioensstand. Tijdens een test sprak hij over de Giulietta als een makkelijk rijdende auto die potentie heeft zoals Cerruti laatste wedstrijd liet zien. Hij heeft hoop op het podium te kunnen eindigen. Kajaia in Alfa 2nd in qualifying. Race 1 JAS Honda Josh Files’ victory only ripened in the final laps, after a close fight with Davit Kajaia’s Mulsanne Racing Alfa Romeo Giulietta TCR. Kajaia, who was also sitting for the first time in the Italian car, matched the second place claimed by Michela Cerruti at Dubai four weeks ago. Race 2 If Josh Files had to work hard to beat Davit Kajaia’s Alfa Romeo and claim victory in yesterday’s Race 1, today he outshone his competitors with the greatest ease, pulling away at the rate of one second per lap. However, this supremacy has prompted an investigation: data have been downloaded from the ECU of Files’ car and results remain provisional, pending checks by the TCR technical department. Behind Files, Kajaia proved the excellent progress of the Romeo Ferraris-built Alfa Romeo Giulietta in both, speed and reliability. Davit Kajaia (second): “I’m very proud of the team and the car. I didn’t have a very good start because I had too much wheelspin and Josh overtook the other cars very quickly. It was a little bit difficult for me to overtake the others and I lost too much time, but finally I took second place. It wasn’t difficult, as I was in Luca Engstler’s VW slipstream and overtook him quite easily. Then I saw Josh was a long way in front of me, so I just kept my pace and so I could control Luca behind me. Now I have to concentrate on Bahrain and try to get on the podium again there. Laatst gewijzigd door Alfa Romeo Miniatura Fer op di mar 20, 2018 11:46, 2 keer totaal gewijzigd. Romeo Ferraris is er met de Eigen inspanningen (geen fabriekssteun) in geslaagd twee top tien rijders te strikken die de Giulietta in het nieuwe GE-Force team uit Georgie gaan vullen. Vooral Dusan Borkovic is een snelle rijder en Kajaia leert snel en beiden dus top 10 vorig seizoen. We zullen zien hoe de Giulietta straks uit de Balance of Performance komt (meer of minder gewicht) en of die competitief zal zijn. Kajaia liet in Midden Oosten al zien dat de vernieuwde Giulietta in staat bleek goede resultaten neer te zetten. Romeo Ferraris is er met de eigen inspanningen (geen fabriekssteun) in geslaagd twee top tien rijders te strikken die de Giulietta in het nieuwe GE-Force team uit Georgie gaan vullen. Vooral Dusan Borkovic is een snelle rijder en Kajaia leert snel en beiden dus top 10 vorig seizoen. Kajaia liet in Midden Oosten al zien dat de vernieuwde Giulietta in staat bleek goede resultaten neer te zetten. 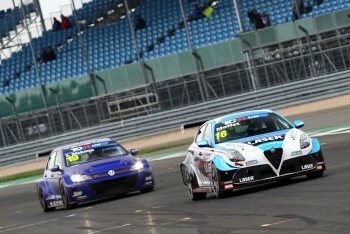 Op het nieuwe circuit Rustavi in Georgië trad het GE-Force team aan met 3 TCR Giulietta's. Kajaia behaalde poleposition voor race 1, Borkovic had probleem met de stuur bekrachtiging en circuit eigenaar Abkhazava werd 16e in de kwalificatie. Michela Cerruti is nu team manager. Georgian fans delighted by first TCR experience. Local hero Kajaia first victory with Alfa. The third season of the TCR International Series couldn’t have started in a more exciting way, as the first-ever visit by the series to Georgia’s Rustavi International Motorpark resulted in two breathtaking races that delighted the thousands of fans that crowded the grandstand to full capacity. 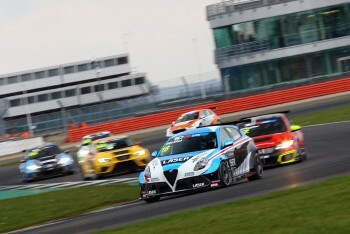 The icing on the cake for them was local hero Davit Kajaia’s victory in the first race at the conclusion of a thrilling four-way fight that involved cars of four different brands. The Georgian policeman showed speed and a cool head in keeping his pursuers at bay and giving the first victory to the Romeo Ferraris-built Alfa Romeo Giulietta. 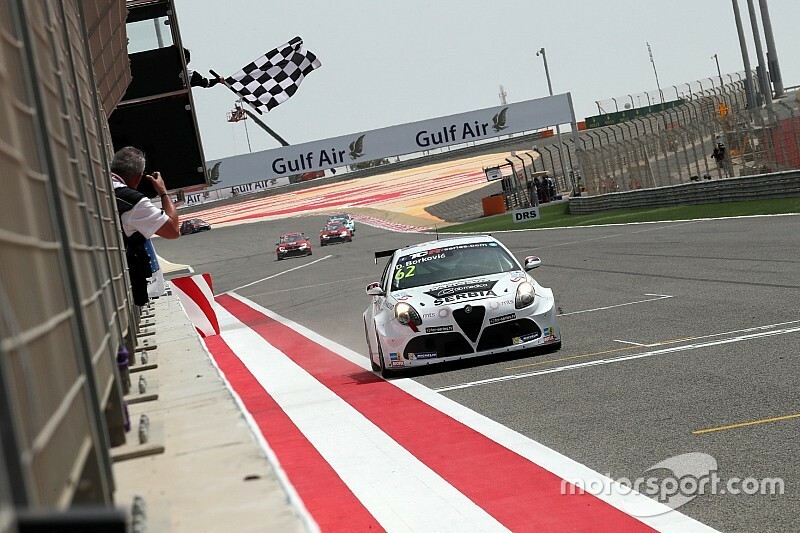 Georgia’s local hero Davit Kajaia and his Romeo Ferraris-built Alfa Romeo Giulietta run by the GE-Force team claimed a fantastic victory after a close fight that involved five drivers representing four different brands of car manufacturers. After sprinting from pole position, Kajaia pushed to the limit and created a gap in the first half of the race, while Attila Tassi (M1RA Honda Civic Type-R), Ferenc Ficza (Zele Racing SEAT León) and Stefano Comini (Comtoyou Racing Audi RS 3 LMS) where fighting behind him. Once Ficza managed to overtake Tassi and close the gap, Kajaia was able to keep him at bay, while Comini and Roberto Colciago (M1RA Honda Civic Type-R) were also chasing the leading pair. Eventually the crowd roared when Kajaia crossed the finish line with a slim margin ahead of Ficza, while Comini kept third place despite Colciago’s last effort. Pepe Oriola confirmed his winning record in the opening event of the TCR International Series; after being victorious at Sepang in 2015 and Bahrain in 2016, the Catalan won the second race in Georgia. Oriola beat his Lukoil Craft-Bamboo teammate Hugo Valente. While the two SEAT León cars of Oriola and Valente pulled away when the race resumed after the safety car, there was a red-hot fight for the fifth position. Eventually Dušan Borković managed to resist the pressure from the likes of Ferenc Ficza, James Nash and Roberto Colciago. Laatst gewijzigd door Alfa Romeo Miniatura Fer op di mar 20, 2018 11:45, 1 keer totaal gewijzigd. Dit keer Borkovic in Bahrein. 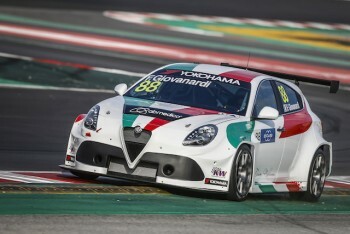 Fabrizio Giovanardi will be reunited with the Italian brand with which he enjoyed success in the early part of the 21st century, driving an Alfa Romeo Giulietta TCR for Romeo Ferraris in the 2018 World Touring Car Cup. The 51-year-old is the latest touring car superstar confirmed for the 2018 WTCR season, which has already seen huge names such as Yvan Muller and Gabriele Tarquini returning, alongside established WTCC champions such as Rob Huff and Thed Björk. Giovanardi, who drove with the Romeo Ferraris team in a test at Monza two weeks’ ago, will be back in a World Touring Car for the first time since 2006, when he raced a JAS Motorsport Honda Accord in a partial campaign while he raced in the British Touring Car Championship. He last raced an Alfa Romeo in 2005, the first year of the World Touring Car Championship, the brand which took him to the 2000-2001 European Super Touring Cup and 2002 European Touring Car Championship drivers’ titles. “I wish to thank everybody at Romeo Ferraris who have made it possible to reach an agreement for the 2018 season,” said Giovanardi. Romeo Ferraris make a significant step forward with the signing of Giovanardi, after two years developing the car in the wild, with Michela Cerruti and Petr Fulín driving the car in 2016, and with Dusan Borkovic and Davit Kajaia racing the car last year under the GE-Force banner, taking three victories in the TCR International Series. “To be able to have Fabrizio with us in such an important venture is a crucial element of our programme,” said former driver-turned-operations manager Michela Cerruti. Ander leuk weetje: er is nu een prijsvraag uitgeschreven waar je zelf de livery mag bedenken. Er is niks van een richtlijn, template of kleurenschema waar je aan moet voldoen. Ben benieuwd wat er uit komt rollen. Proef ik iets van een wederopstanding? Het Mulsanne Racing Team van Romeo Ferraris en Michela Cerruti doet de overstap naar WTCR met 2 Giulietta TCR voor veteranen Alfa 156 ETCC-WTCC/BTCC kampioen Fabrizio Giovanardi en Gianni Morbidelli. 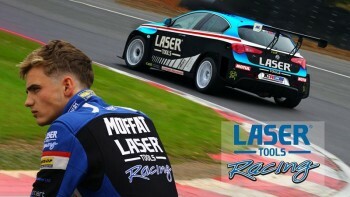 Ook in het Brits kampioenschap rijden 2 Giulietta TCR voor junioren Moffat en Palmer bij Laser Tools Racing. Door de deelname van vele semi fabrieks- en prive teams met WTCC stercoureurs worden de internationale en regionale TCR races spannend en attractief. Met veel gehomologeerde merken : VW Golf, Audi RS3, Honda CIVIC, Seat Leon Cupra, Hyundai i30, KIA, Lada Vesta, Opel Astra, Subaru WRX, Peugeot 308 en Renault Megane garant voor een volle grid. In het wtcr loopt het niet. Slaan geen deuk in een pakje boter. Team Mulsanne’s Alfa Romeo Giulietta TCRs where closer to the leading pace when the Hungaroring hosted the all-action WTCR – FIA World Touring Car Cup presented by OSCARO last weekend. However, myriad setbacks meant the Italian squad wasn’t able to enjoy the success it craved. Drivers Fabrizio Giovanardi and Gianni Morbidelli were eliminated from Race 1 following contact with two Audi-driving rivals. Sunday brought more promise with Giovanardi one-tenth shy of a shot at Qualifying Q2, only to have his times disallowed following a weight-check infringement. Race 2 produced more frustration when Giovanardi and Morbidelli – who had been slowed in Second Qualifying by a failing throttle sensor – collided. 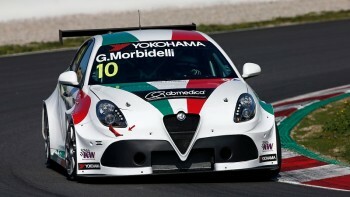 And while Giovanardi retired from Race 3 with a puncture, Morbidleli charged through to claim P15.